Statutes, common law, contracts and the human element all work together or in necessary conflict with each other to allow or push the workers' compensation machine to produce the result it was designed for - a safety net for workers injured on the job. Statutes, common law, contracts and the human element all work together or in necessary conflict with each other to allow or push the workers' compensation machine to produce the result it was designed for - a safety net for workers injured on the job. 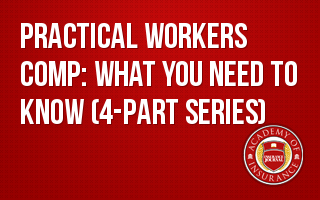 This four-part webinar series provides an in depth study on these "moving parts" that make the workers' compensation policy work. Rarely is policy language discussed because it is only a small part of the workers' compensation "machine." For an injury to be compensable it must "arise out of and be in the course and scope" of the worker's employment. "Course and scope" is not always black and white; there is sometimes a bit of gray area. This session will illuminate some of the gray areas and guide the participant through some interpretations of "course and scope." Who qualifies as an "employee?" The answer can depend on statute, contract and the facts surrounding the relationship between the worker and the individual or entity making use of the worker's services. Session 2 dissects employee/employer relationships to avoid surprises following a loss or at audit. Potential coverage limit gaps or the complete loss of coverage are possible when employees work in states in which the employer has no specific location. To avoid these gaps or the loss of coverage requires recognition of the problems and knowledge of the available solutions. This session highlights the problems, focuses on the solutions and provides guidelines and rules that should be followed in deciding to name a state. Employers' Liability protection is often overlooked or just plain ignored by many agents and brokers. The gaps filled by this coverage are too important to act carelessly when planning this protection. This session provides a new appreciation for the importance of employers' liability protection.